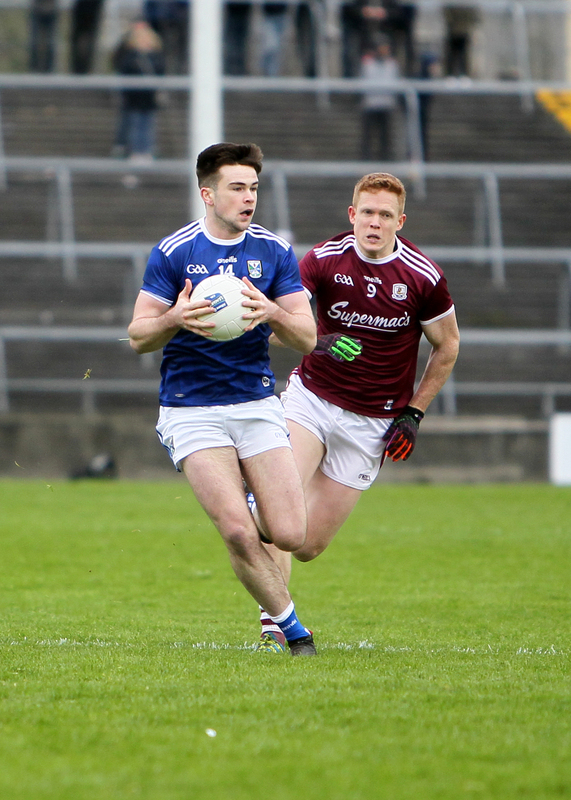 Cavan played with 12 players for four second-half minutes after three sin-binnings, and Padraig Cunningham kicked three points from play to give Galway a winning start to their Division 1 campaign. Cavan bossed the first-half but failed to punish Galway’s slow start, but they were much better in the second period with Shane Walsh and Johnny Heaney finding the target. Galway had two players black carded and Cavan had three in the second half, and key scores in that period saw Galway pull clear for victory. Before the start Galway manager Kevin Walsh made five alterations to the team that was named, with the return of Corofin duo Ian Burke and Liam Silke a real boost for his side. But it was another one of the changes that started the scoring when former Galway United striker Padraig Cunningham pointed on the turn following a good delivery from Gary O’Donnell. But by and large it was Cavan that shone brightest in the opening quarter and some of their point taking was impressive. A foul on Conor Madden allowed Pierce Smith to level the scores, but Madden’s point that followed from the right corner off his right foot was a sweet score to give Cavan the lead. Cavan goalkeeper Raymond Galligan ran forward to score a free for his side in the tenth minute, but he had another two chances before half-time, both of which he put wide, as Cavan’s interval tally of five wides and another five dropped short meant the scoreboard didn’t reflect their dominance. After Shane Walsh missed a simple free, a good Peter Cooke score on the run brought Galway to within a point of their visitors, but a Martin Reilly free and a lovely Jack Brady score following two long kick passes put them 0-5 to 0-2 in front after 23 minutes. But as Cavan missed their chances, Galway started to take theirs. Walsh landed a free off the ground, before substitute Gareth Bradshaw bagged his first after 27 minutes. Galway should have taken the lead on the half-hour mark, but Johnny Heaney’s shot lacked accuracy and Galligan turned it over the bar, which left it 0-5 each at the interval. It only took ten seconds for Cavan to add to their tally when they broke quickly off the throw in and Reilly scored, but Galway worked hard at the other end and a link between Walsh and Burke put Cunningham in on goal but his shot was tipped over smartly by Raymond Galligan. The loss of Cillian McDaid to the sin bin for a hand trip on Thomas Galligan after 38 minutes left Galway down to 14 players for ten minutes and Cavan soon retook the lead when Pierce Smith landed a free, but Walsh hit back for the home side to make it 0-7 each. Despite being a man down Galway took the lead for the first time since the opening minutes when Walsh landed a long range free, only to see Brady curl over a lovely score straight from a sideline kick. Galway were fortunate to not have Ciaran Duggan sent off for a high tackle after 47 minutes, and three minutes later Reilly was sin binned when he pulled down Johnny Heaney. In a crazy five minutes both Killian Brady of Cavan and Cooke were both sin binned, and Cavan were reduced to 12 players when Killian Clarke delivered a late hit on Walsh in the build up to a score for Ian Burke. Before Reilly returned, Heaney found himself unmarked to give Galway a 0-12 to 0-8 lead with nine minutes remaining, and, after Walsh landed his fourth, Cavan rallied with the last three scores but Galway held on to take the win. There were five Allianz League debuts in all for Cavan in starters Pierce Smith, Conor Rehill and Barry Fortune and substitutes Paul Graham and Luke Fortune. Scorers for Galway: Shane Walsh 0-4 (0-4f), Johnny Heaney 0-3, Padraig Cunningham 0-2, Peter Cooke 0-1, Gareth Bradshaw 0-1, Gary O’Donnell 0-1, Ian Burke 0-1. CAVAN: Raymond Galligan (Lacken), Jason McLoughlin (Shannon Gaels), Padraig Faulkner (Kingscourt), Barry Fortune (Cavan Gaels), Niall Murray (Cavan Gaels), Ciaran Brady (Arvagh), Conor Rehill (Crosserlough), Michael Argue (Bailieborough), Killian Clarke (Shercock), Pierce Smith (Crosserlough), Dara McVeety (Crosserlough), Martin Reilly (Killygarry), Jack Brady (Ramor United), Thomas Galligan (Lacken), Conor Madden (Gowna). Subs: Killian Brady (Mullahoran) for Fortune (HT), Kevin Tierney (Ballyhaise) for Argue (57), Paul Graham (Cavan Gaels) for Smith (61), Cian Mackey (Castlerahan) for T Galligan (65), Luke Fortune (Cavan Gaels) for Faulkner (66). GALWAY: Ruairí Lavelle; David Wynne, Seán Andy Ó Ceallaigh, Eoghan Kerin; Gary O’Donnell, Liam Silke, Seán Kelly; Ciaran Duggan, Tom Flynn; Cillian McDaid, Peter Cooke, Johnny Heaney; Padraig Cunningham, Ian Burke, Shane Walsh. Subs: Gareth Bradshaw for Wynne (20), Danny Cummins for Cunningham (65), Cein D’Arcy for Flynn (70), Johnny Duane for Burke (72).